Sometimes I get really angry when I finish a book. So angry I can’t speak for a while. When I get this kind of anger, it’s not because I didn’t like a book. It’s because I liked it so much I’m mad I finished the book. And in the case of Lady Thief, I’m mad I didn’t make myself wait because now I have another break between books. Scarlet’s secrets are out. She’s not Will Scarlet, boy thief. She’s Lady Marian, Lord Gisbourne’s betrothed. He’s hunted her down and she was forced to marry him to save Robin. She refuses to play wife, though, and returns to her band, knowing that she loves Robin and he loves her. But when Lord Gisbourne returns and makes a deal with Scarlet, she knows better than to trust him; she just can’t see what he’s planning. And with Nottingham in need of a new sheriff, there’s even more at stake. Scarlet is forced to fight in a different way in Lady Thief. She can’t rely on her experience on the streets. She’s expected to play the part of noblewoman and there’s no place for knives and fighting there. She must think of different ways to fight back and give Robin the best chance she can. The court of Prince John can’t think of her as a noblewoman, but as nothing better than a commoner, someone not worth their time or respect. She finds an ally where she least expects it and uncovers a secret that makes her question everything about her. The moments between Scarlet and Robin are, for the most part, wonderfully sweet. They love and respect each other, something difficult to find in that time period. Robin is fighting his demons, though, and not every moment is sweet. He has problems that are unknowingly taken out on Scarlet, something he can’t forgive himself for, nor should he. The struggle between them is real and it’s going to be difficult to find their perfect happiness. I have hope that they will continue to fight for each other and the life they want to create together. Scarlet blew me away. 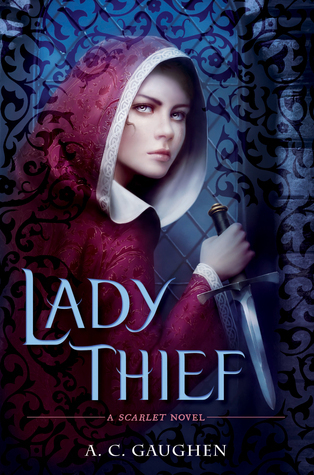 I’ve been anxiously waiting for Lady Thief to be released and it didn’t disappoint. I finished and felt that wonderful anger, the kind that lets me know I just finished an amazing book that I didn’t want to end. Gaughen has a fantastic series on her hands and I’ll be not so patiently waiting for the conclusion. This is a must read novel and series. This entry was posted in Historical Fiction, Something a Little Different, The Must Reads, Young (and New) Adult and tagged A. C. Gaughen, Fantasy, Historical Fiction, Must Read Series, Must-Reads, Young Adult.